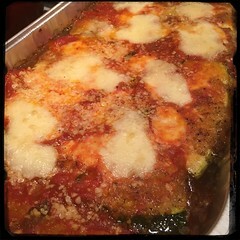 We love eggplant but we also love zucchini… Here we take our tried and true method of making Eggplant Romano/Parmigiana and use zucchini instead. It’s a delightful variation that’s equally as delicious as it’s predecessor and divine inspiration. 1. Slice the zucchini about 1/4 inch thick and soak in water and salt. Remove from water and rinse excess salt, let drain. 2. *Beat the 2 eggs, brush the beaten egg onto one side of a slice of zucchini, place egg side down in the seasoned breadcrumbs. 3. *Brush the beaten egg onto the top side of a slice of zucchini, sprinkle breadcrumbs covering top. Both sides of zucchini slices are coated with breadcrumbs. 4. Preheat 4 tbsp avocado oil (+ 1 tbsp olive oil) and fry slices until brown on both sides, set aside. 1. in a deep baking pan (pyrex will do), add 1 ladle of sauce to coat the bottom. 2. Place fried zucchini making a layer. 3. ** Add a dollop of sauce to each slice of zucchini , then some stated cheese (Romano or Parmesan) and finally some mozzarella. 4. repeat step 3 until you have filled the pan. 5. Pat down and add the final layer of sauce, mozzarella and Pecorino Romano cheese. Bake at 330F for 30-45 minutes or until mozzarella melts and develops a slightly brown crust, remove and let sit for 10-15 minutes before serving. ** if the zucchini slices are not breaded, you can sprinkle breadcrumbs on the slices as you layer them, before the dollop of sauce.